A minimum service is in operation across Belgium’s railway network during the 48-hour strike that came into effect on Thursday at 22.00, reports RTBF. The network will be heavily disrupted throughout the day, said SNCB spokesperson Dimitri Timmerman. Passengers are recommended to regularly consult timetables and the SNCB journey planner up to the moment of departure. The minimum service – in operation for the first time – means staff are spread around the main railway lines. One train in three is running with the IC lines mainly in service. Trains to the coast will also be affected by the strike this weekend. “When there is good weather, we usually run an additional service to the coast, but many trains in that direction will not be operating,” said Timmermans. Rail passengers can expects some IC trains to be running throughout the day, but the S and L service will be limited to rush hours. The majority of P trains will not be in service. 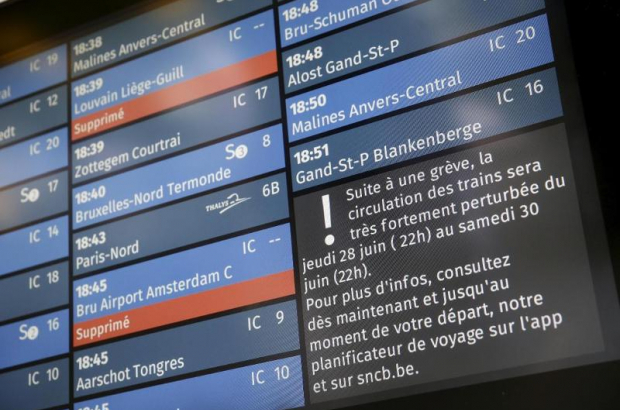 The departure time of some trains will be adapted, according to latest information from SNCB.